Jay Rigby has chosen the SSL L500 console for Front of House duties on the recent Queens of the Stone Age world tour, supplied by Eighth Day Sound. In this interview, at the Eden Sessions UK, he talks about his creative approach to the QOTSA signature sound, dealing with mid-range madness, working with a 'variable' set-list, and the role the L500 console plays in everything. In Part 2 of this interview, Depeche Mode's Front of House Engineer Antony King talks about his choice of SSL Live L500 consoles, how he sets up and uses those consoles, and offers some real world advice on live drum production, reaching the back of the stadium, as well as spilling the beans on Dave Gahan's vocals. Chris Stephens, FOH Engineer for Jason Aldean talks to SSL about the L500 live console. Rick Smith and Karl Hyde talk about using the SSL L500 console live on stage. Solid State Logic L200 at Poppodium Patronaat, Haarlem. Poppodium (‘Pop Stage’) Patronaat is a popular three-room venue in the historic city of Haarlem, the Netherlands. Recently it has upgraded the audio systems in two of its rooms by installing four SSL L200 consoles at front of house and monitor positions. All consoles were supplied by SSL Live Distributor Audio Electronics Mattijsen (AEM). Rob Ziemba, Monitors, Chance The Rapper. Monitor Engineer Rob Ziemba talks about his experiences with the SSL L500 console during the latest Chance The Rapper tour. Front of House Engineer Kyle Bulmann talks about his experience with the SSL L500 Plus live console during the latest Chance The Rapper tour. The Analogues is an extraordinary band with an ambitious mission. The aim is to recreate, live, the last six Studio albums of The Beatles using the same instruments, amplifiers, and arrangements. The band has tracked down and restored period instruments from all over the world, such as a rare Lowrey Heritage Deluxe Organ, as used on the introduction to Lucy In The Sky With Diamonds. 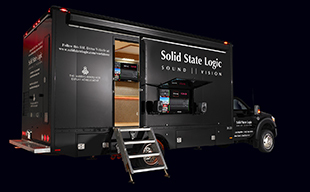 Remko Luijten, the Band's Front of House Engineer, and Ger Arts, Monitor Engineer, talk to Solid State Logic about bringing that ambition to stage, most recently at the Ziggo Dome (Amsterdam) on the 50th Anniversary of the release of Sgt Pepper. Antony King is the fingers behind the faders behind Depeche Modes's epic Global Spirit Stadium Tour that spans 2017 and 2018. In Part 1 of this interview he talks about his own background and how he prepares for a tour like this, as well as offering some insight into the technical and creative aspects of a Depeche Mode gig, and how you get that kind of gig in the first place. A video interview with Director of Technology, Matt Glover, and Production Manager Landon Robertson - church mixing, loudness, and technology choices. The Church at Brook Hills (Alabama) uses SSL L300s at FOH and monitors. During sound check at the Mohegan Sun Arena, Front of House Engineer Kenny Kaiser takes time out to share wisdom from his years or experience in live sound engineering, and from life on the road with US rock phenomenon, The Killers. How do you get a church to rock? Respected Production Manager and Front of House Engineer Andrew Stone talks about how Tulsa's Church On The Move has carved character into its message, and why he switched from all-analogue to SSL Live.